Two Goa’uld motherships pursue a small glider in orbit of a large, beautiful planet. Ion cannons on the surface blast forth, destroying one, then the other ship. The death glider falls into the atmosphere, crash-landing in a remote region. Local village men rush to the scene, and find Skaara, missing friend of SG-1, injured and pleading for help. Skaara has spent the past two and a half years possessed by the evil Goa’uld Klorel, and participated in a thwarted attempt to attack Earth (“Within the Serpent’s Grasp”). Pursued by an enemy Goa’uld, Heru’ur, Klorel fled to the planet Tollana, inhabited by a highly advanced race of humans (“Enigma”). Klorel knew that they would destroy Heru’ur’s ships, and his bet paid off. But now, a new problem has surfaced. Klorel temporarily lost control of the strong-willed Skaara, who requested to be freed from the “demon” Goa’uld within him. Because both Skaara and Klorel are sentient beings within the same body, the Tollan call a triad — a civil trial, to determine who should have sole control of the host body. To represent him, Skaara summons his close friend Jack O’Neill and his brother-in-law Daniel Jackson. Narim, a leader among the Tollan and former flame of Major Carter’s, goes to Earth and brings SG-1 to Tollana. The reunion with Skaara is tense, since O’Neill doesn’t want to get to close to a boy infected with a “freakin’ Goa’uld.” But Skaara and Klorel wear a Tollan device that suppresses the parasite’s control over the host, allowing both to speak freely. Also present at triad is Lya, a beautiful woman from the highly advanced and passive Nox (“The Nox”). Though she is a friend of SG-1, Lya has been brought by the Tollan to serve as a neutral “arcon,” a combination of attorney and judge. It is she who will cast the final vote for Skaara or for Klorel. Representing Klorel is Lord Zipacna, a Goa’uld and one of Apophis’s most loyal underlords. Zipacna argues that the Goa’uld use humans when needed because they are lower, less intelligent lifeforms — just as humans use animals for food and as beasts of burden. Skaara offers testimony of the horrors he has gone through, the atrocities he has forced to witness helplessly. Meanwhile, Teal’c and Carter follow the Jaffa soldiers who came to Tollana with Zipacna. They observe them tampering with the Tollan ion cannons in some way, and presume that the Goa’uld are planning an attack and using the triad to buy time. Their claim is supported when a Goa’uld mothership arrives in Tollana orbit. The Tollan examine the cannon, but find no tampering. Carter suggests that the Jaffa may have been “painting” the cannons — marking them as targets, so that they could be taken out from space. But the Tollan are arrogant in their advanced technology, believing that nothing can harm them — especially not an attack from such a less-advanced race as the Goa’uld. Chancellor Travell ignore SG-1’s warnings, and demand that not another word of it be spoken, threatening that O’Neill and Jackson will be replaced by someone else as Skaara’s arcon if they persist. Disobeying O’Neill’s order, Teal’c pursues the matter. He visits the Nox woman, Lya, and enlists her help. Meanwhile, the trial continues. Lord Zipacna now argues that Klorel cannot be separated, since he would die without a host and Tollan law forbids the death penalty. O’Neill and Jackson suggest that the Tok’ra could remove the parasite without killing him, and find a new host. A final vote is called, and Lya finds in favor of Skaara. Both beings have the right to live, she says, but life as a slave in one’s own body is not life at all. Using a hidden communications device, Zipacna signals the orbiting vessel, and the Goa’uld attack begins. Everyone rushes outside, and Goa’uld death gliders fly down and attack the city. The ion cannons have indeed been targeted, and blasts from the ship destroy them all simultaneously. Teal’c and Lya reveal their plan to the rest of SG-1. Lya has used her powers of illusion to hide one of the cannons. Teal’c, having observed the cannon’s controls over the shoulder of a Tollan technician, fires it, and destroys two death gliders and the Goa’uld mothership. Tollana has been saved. The Tok’ra arrive, and remove the Goa’uld Klorel from Skaara’s body. He is to be taken to the Goa’uld world of his choice. Skaara, though, is finally free. It is not revealed how Klorel came to be fleeing two of Heru’ur’s motherships in a small death glider. The vessels do not have long-range capability, so he likely came from a larger vessel of his own. Perhaps Klorel used the glider as a means of escape when his own ship was destroyed by Heru’ur’s superior forces. Heru’ur has lost another two motherships, making a total of five lost in the last year and a half, including the three taken by the Asgard (“Thor’s Chariot”), assuming that the Asgard didn’t simply transport the ships away from Cimmeria and give them back to Heru’ur. When Apophis, another powerful Goa’uld, lost two motherships in attacking Earth (“The Serpent’s Lair”), his position among the Goa’uld was significantly weakened (“Family”), even leading to his eventual defeat by rival Goa’uld Sokar (“Serpent’s Song”). The Tollan’s ability to pass through solid matter with their advanced technology apparently extends to an animal not wearing one of their devices, as well as a person who has not fully reintegrated after going through a wormhole (the iris is less than four micrometers from the event horizon, so it does not allow matter to reintegrate). 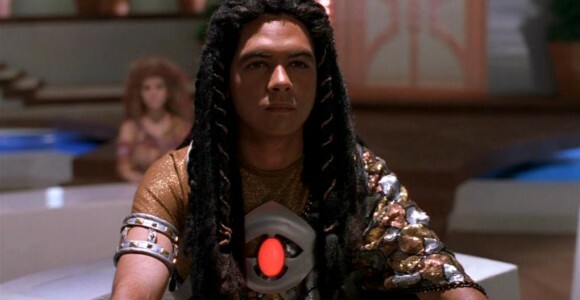 Using this technology, both Narim and his cat were able to pass through the S.G.C.’s Stargate iris, after the iris appeared to lose matter integrity. It is likely that the Tollan directed a particle beam, of similar technology to their wrist devices, through the Stargate at the iris, allowing the cat to pass through. After arriving on the Nox homeworld (“Enigma”), the Tollan refugees rescued by SG-1 found a way to the new Tollan homeworld, with help from the Nox. Perhaps this is the reason for the Tollan’s new Stargate. They may have received information on constructing a Stargate from the Nox, one of the universe’s oldest races, and communicated that information to Tollana. Or, perhaps the Nox do have a vessel (or vessels) capable of deep space travel, and simply ferried the Tollan to their new homeworld. The former explanation seems more likely. The new Stargate on Tollana is smaller in circumference and much thinner than a standard gate. It is also whitish in color, rather than gray, and does not seem to have any glyph markings on it. It may be a “next generation” Stargate, with additional capabilities, or simply a standard Stargate with a reflection of the Nox’s (or Tollan’s) taste in design. The room assigned to the Goa’uld on Tollana has a banner with the symbol of Apophis’s serpent guard marking it. SG-1’s room has a banner with the Stargate symbol for Earth. Klorel not only knew who the Tollan were, but he knew their level of technology, and the location of their homeworld. He fled Heru’ur’s forces to Tollana, knowing that the Tollan would destroy Heru’ur’s ships. It is not revealed how he came upon this knowledge,whether he has had prior dealings with the Tollan, or if any other Goa’uld know of the Tollan. Now, the Goa’uld most certainly know of the Tollan’s existence, and consider them a great threat. Further incidents may arise from this event, especially since the Tollan took it upon themselves to forcibly remove a powerful Goa’uld from his host — a direct assault on the Goa’uld way of life. By Goa’uld “law” (if they do indeed have a codified legal system), the people of a Goa’uld-ruled planet are the property of the Goa’uld. Skaara and the rest of the Abydonians were considered, at least by Lord Zipacna, to remain the property of the Goa’uld even after Ra’s death. This may be a part of Goa’uld law, or it may just be Zipacna’s deceptive interpretation of their law. Considering the feudal nature of the Goa’uld, it seems unlikely that the possessions of one Goa’uld would become the property of another (or of the species in general) after his death. There seems to be a difference between a “Jaffa” and a “serpent guard.” Teal’c identified the group of men tampering with the ion cannons as “two Jaffa and a serpent guard.” It would seem that “Jaffa” is a generic term that refers to all who serve a Goa’uld, as soldiers and Goa’uld incubators. “Serpent guard” refer to a select group of Jaffa who serve in a higher military position in the armies of Apophis and Klorel. Zipacna argues that “nothing of the host survives” the joining with a Goa’uld symbiote. This echoes back to the first episode, “Children of the Gods,” where Teal’c indicates that nothing of the host survives. This claim of the Goa’uld flies in the face of clear evidence to the contrary: Skaara speaks as himself when he is not under Klorel’s control; Sha’re communicated to Daniel an instant before her death (“Forever In a Day”); and Kendra survived the removal of a Goa’uld and lived for many years as herself (“Thor’s Hammer”). Zipacna later concedes that the claim is false, at least for the purposes of the triad. But the idea may be a standard line as far as Goa’uld are concerned. Perhaps this helps them to justify keeping their hosts, to others and even to themselves. Jackson rightly points out that the Goa’uld have acquired virtually everything they have from other species — even Stargate technology, which was developed by the Ancients(“The Fifth Race”). They are parasitic in nature — culturally and technologically, as well as biologically. In order to mark every ion cannon on Tollana as a target, the Jaffa would have had to travel vast distances in a relatively short amount of time. We see in the opening scene that the cannon blasts that destroyed Heru’ur’s ships came from all over the planet’s surface. The Goa’uld probably had soldiers moving about in ships, as well as in the main city. It is ironic that just as the Goa’uld consider themselves above humans, and thus justify using them as hosts, so also do the Tollan arrogantly consider themselves superior to the Goa’uld and Earth. And just as the arrogance of the Goa’uld is often a means for their defeat, so also are the Tollan compromised by their arrogance of superiority. In some respects, the Tollan are more like the Goa’uld in attitude than they are like the humans from Earth. The Tollan are now indebted to SG-1 for saving their world from Zipacna’s attack. Though they still refuse to share technology with less advanced species, this may turn into a much needed favor in the future. After Klorel is removed, Skaara emerges in the uniform of a Tok’ra — the Goa’uld resistance fighters. This may indicate that Skaara intends to join the Tok’ra, but this seems unlikely. Skaara would not be anxious to become a volunteer host after his experience with Klorel, though he would certainly be of great value to them considering the amount of inside knowledge he has obtained. The Tollan have developed a device that can suppress the control that a Goa’uld has over its host. A lighted indicator on the front of the device, warn over the chest, forbids one being from impersonating the other. The device lights a large, blue light when the host is speaking, and red when the parasite is in control. The Tollan have not been at war in many generations, according to Teal’c. Tollan law does not allow the death penalty as a punishment. The Tollan have the knowledge of how to contact the Tok’ra. It is not revealed how they even knew of the Tok’ra’s existence, let alone how to contact at will the always-moving group. But it is logical that they can do so, as the Tok’ra presented Earth with a Tollan communications device to use to reach them, saying that the Tok’ra are friends of the Tollan (“Serpent’s Song”). Skaara – After being enslaved within his own mind for two and a half years, Skaara is free of Klorel. He has witnessed countless atrocities, many at his own hands — and will surely be scarred by them. Skaara has a strong spirit, and fought Klorel every day since being joined. He said that he listens to Klorel, and learns from him. Skaara’s future — whether he will return to Abydos, live on Earth, or go somewhere else — has not been determined. Klorel – Klorel has lost his host, and is to be taken to the Goa’uld world of his choice. He must find a new host soon, or die. The Goa’uld may be one of the first in history to lose a host that has not died, and will likely wish revenge upon Skaara, SG-1, Lya and/or the Tollan. Teal’c – Teal’c rarely disagrees with O’Neill, but in this instance he took it upon himself to disobey direct orders and take matters into his own hands. Teal’c is loyal to O’Neill and the interests of Earth, but has a higher goal of defeating the Goa’uld. That will always be his final standard of judgment. Teal’c also reveals that he knows how to render a Goa’uld unconscious with a certain hold. Samantha Carter – Because of her joining with the Tok’ra Jolinar of Malkshur (“In the Line of Duty”), Carter still has to straighten out her own feelings from those of Jolinar. She therefore refuses to become involved with any potential romantic interests — whether it’s Narim, Martouf or someone else. Narim – As a typical Tollan, Narim has demonstrated that his people remain arrogant, even to the point of discounting a logical warning of attack. Though their technology is advanced, the Tollan attitude is not. Narim has also expressed his continued fondness for Major Carter, though she cannot allow a relationship with him at this time. Lya – Lya walked a fine line of pacifism on Tollana, and knows it. The Nox are pacifists in nature, but Lya agreed with Teal’c’s plan of hiding one ion canon from the Goa’uld. Perhaps she is simply a realist, acknowledging what the arrogant Tollan would not: that the Goa’uld would likely attack with force. Pacifism does not always mean submitting to the inevitability of violence. 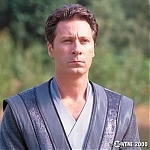 Heru’ur – Heru’ur went after his enemy Klorel with two Goa’uld motherships, and has lost them both. This will likely have a strong impact on the state of his army. Heru’ur may also seek retribution from the Tollan for the loss of his ships and soldiers. 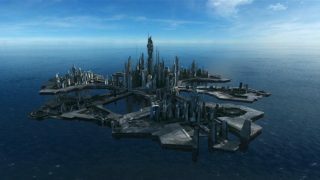 How did the Tollan refugees get from the Nox world to the new Tollan homeworld? What else has Skaara been forced to witness? Further, what knowledge does he have that can be of use to the fight against the Goa’uld? Certainly, he has acquired a great amount of sensitive knowledge due to his possession by such a powerful Goa’uld. What are the implications for Heru’ur in having lost two motherships? What is the current state of Apophis’s old forces? Has Zipacna or Klorel taken charge of Apophis’s resources since his death (“Serpent’s Song”)? Is Zipacna now an underlord of Klorel, or has he taken a stronger role and assumed Apophis’s place? How will this army be affected by the fact that Klorel has lost his host? Do Klorel or Zipacna know that Apophis is alive (“The Devil You Know”)? Does Skaara know that Sha’re is dead? VOTE! How would you rate SG-1's "Pretense?"